One small town. Four incredible brides. I’m super excited to tell you that the first book in this brand new series – Outback Brides– is now out in the world! I’ve been working with three other fantastic Australian authors – Kelly Hunter, Cathryn Hein and Fiona McArthur – and we’ve created a gorgeous little town in northern Victoria called Wirralong, and a place called Wirra Station. In the first book Kelly Hunter’s Maggie’s Run, Maggie Walker inherits a run-down grazing property on the edge of the outback, but she has no intention of ever calling it home. But cowboy next door Maxwell O’Connor has plans for both Maggie and Wirra Station. If only he can get her to agree to them. A year later, Harry Harrison’s bride is still a mystery. Who was she? Where was she? And why did she run? 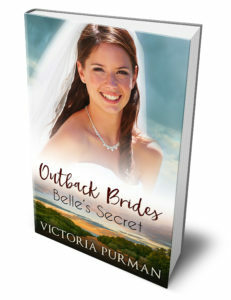 When Harry flies to a Australia for his best friend’s wedding, he runs straight into the woman he’s never been able to forget. All she asks is for their marriage to be kept a secret. All he asks is for a divorce. But after a week together, Harry and Isabella are forced to face what they really want. Here’s where to buy Belle’s Secret from all your favourite etailers: Amazon Australia, Amazon US, Amazon UK, iBooks, Kobo, GooglePlay and Barnes and Noble (Nook). If you’d like to read a print book, I have them for sale too. All you need to do is email me at victoria@victoriapurman.com and I’ll send you the details. Look out for books three and four in the Outback Brides series – Cathryn Hein’s Elsa’s Stand and Fiona McArthur’s Holly’s Heart. It was so much fun as a writer creating Wirralong with these authors, and the shops and businesses and people who inhabit it. If you loved following the characters through my Boys of Summer series, you’ll absolutely love these stories, I guarantee it.